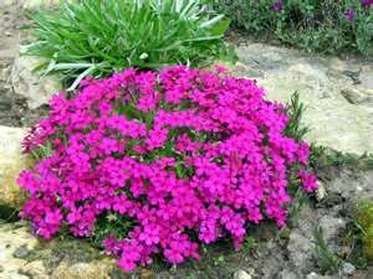 Crackerjack Phlox is a very compact perennial that are covered with bright magenta-red flowers from mid spring to late spring. It will grow to a height of 2" to 4" tall and 10" to 12" wide. Cut the plants back after flowering to maintain a compact habit. Crackerjack Phlox likes to be planted in full sun and well drained soil. Plant Crackerjack Phlox in a sunny Rock Garden, Miniature Garden, as ground cover, for edging, or in alpine troughs and mixed containers. You can even use this flower as a cut flower to brighten up a springtime vase. It won the Royal Horticultural Society Award of Garden Merit winner in 1993. Crackerjack Phlox is deer resistant and is also a Firewise Plant.